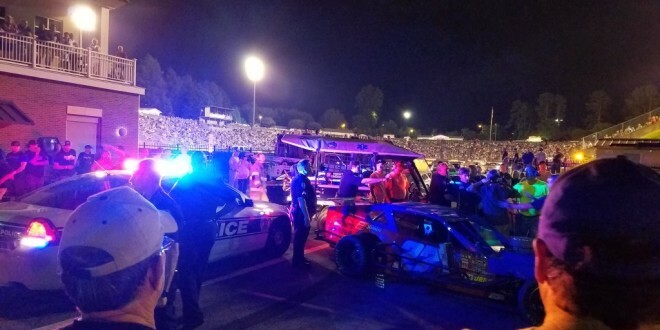 WINSTON-SALEM, NC- Modified car owner David Hill was injured and his former driver, Joe Ryan Osborne from Kannapolis, N.C. was arrested during an altercation in the pit area following Saturday night’s second 50-lap Modified race at NC’s Bowman Gray Stadium. Hill told Area Auto Racing News that he approached Osborne’s car just to talk to him as Osborne was passing by Hill’s pit stall on the way to his own stall. Osborne then drove forward, and then spun his car around with Hill hanging onto Osborne’s helmet to avoid being thrown from the car and run over. Osborne denies trying to cause anyone harm, and he also contends that Hill’s crew became involved, throwing punches in his direction, forcing him to take action with his car to get away from them. Hill contends that he was the only one near the car during the entire incident, while Osborne insists that it was multiple crew members throwing punches at him. For many more details from Saturday’s altercation, and the race check out the next edition of AARN, available on Tuesday with the online edition.